The Water Hyacinth is a beautiful plant. It has glossy green leaves and lavender blue flowers. The submerged roots are long and hairy and chocolatey brown. They serve as an excellent hiding place and spawning location for many fish. 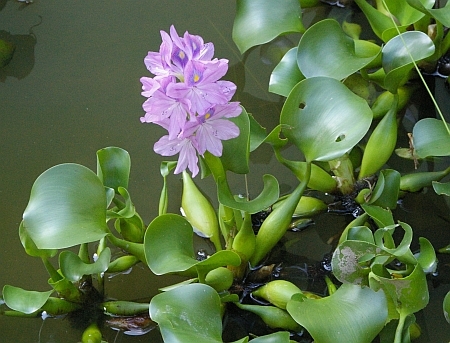 When kept in an aquarium, the Water Hyacinth will gradually cover the aquarium surface with its offspring. It will grow to about four inches high, with the occasional 6 inch flower spike. It is generally easy to keep, but will often hog nutrients and light, so is best kept either isolated from submerged plants below or in its own aquarium. Water Hyacinths require a lot of light, but can’t be too close to the light source. The aquarium will usually need to be uncovered, but alternatively shallow water can be used. Also damp warm air is necessary for optimal growth. Although it is highly decorative, it tends to complicate tank maintenance. Extra care needs to be taken that the Water Hyacinth is never released into the wild, because it can clog waterways. It is on the invasive species list of many countries. AquA AnimaniA is your #1 local source for Water Hyacinth along with a large selection of healthy live aquarium plants and other robust pond plants. We also feature a wide variety of small animals, pets, aquarium fish, pond fish, amphibians, reptiles and more! To properly care for your pets, we also carry a comprehensive and extensive line of pet supplies including equipment, foods, treats, aquariums, tanks, cages, supplies and toys for dogs, cats, birds, small animals, amphibians, reptiles, fish, exotic pets and critters.